Even before the check hit my mailbox, I’ve been busy on making the Women’s Online News Franchise a reality. Explore content management systems. Consult legal on franchise structure. Confirm site locale. Get/sign nondisclosures. Draft teaming agreements (co-development agreements). Find some partners on this venture. Sigh. The work of an entrepreneur is never done. But first and foremost, finding a CMS that would allow me to grow. Simple, back-end interface that makes posting and administration easy. A CMS that allows for multi-site functionality, meaning content and ads and other “content” can be pushed across sites that are geographically dispersed. A CMS with a social networking feel, that *gets* that community is more than information and news…it’s about the people. That allows for multiple templates at the town and story content level. And a partner that understands that we’re flying while building the plane. What I found is a bunch of open-source and proprietary solutions along the way. I should state up front that I’m biased against the blog-type format for content. I’m looking for something that’s NOT a blog and NOT a newspaper regurgitated online. I want to operate against all the paradigms that currently operate about the binaries of blogs and newspapers. I want to avoid all the biases against “hobbyists” and “nonprofessionals” and “legacy” and “established”. I want something new and different that doesn’t feel like any of these environments. There’s Moveable Type. And Drupal. And WordPress. And Soapblox.net, which I wish I’d had more time to explore. But on the way to Oz to find those CMS wizards, I had to make a few compromises. 1. WordPress: The behemoth in the space and the choice of many placebloggers. 2. Neighborlogs Beta: A platform I found specifically for those hyperlocal startups. 3. Village Soup Open-Source and Enterprise Versions: With funds from the Knight News Challenge, these folks built the open source code, then rebuilt the platform with even more bells and whistles in the enterprise version. 4. Creative Circle CommunityQ: This is the platform that I used for MyTopiaCafe.com in Florida (now defunct). Flexible home and secondary page templates. News and information site feel, no linear blog post structure. Rich user profiles with pictures and bios so community members could see each other. Content flexibility: text, video, audio, blogs, forums. 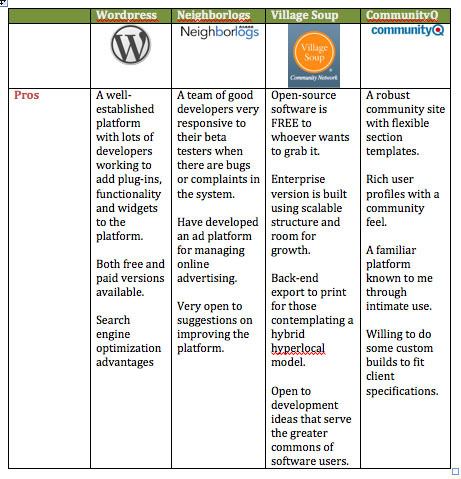 Flexible opportunities for revenue: classifieds, display ads, marketplace structures in place. 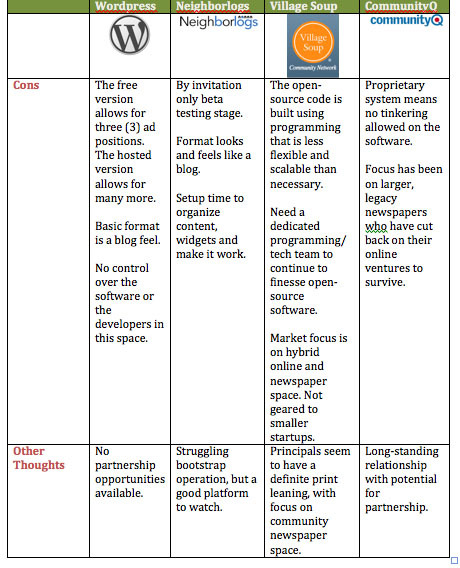 I’m close to making a decision on a platform and I’m negotiating pricing with tech partners. But it’s really not just about functionality, it’s also about relationships and willingness to grow and vision and pricing and commitment to community and responsiveness…so many things that are difficult to put in a pro/con table. This conversation about a technology partner has generated a great deal of offline comments about other platforms and software that I’m going to try and capture these BEFORE I choose a platform for the franchise. Just one more week for you all to convince me there’s something better out there. NEXT MONDAY: The big decision…I think.